This beauty has of the longest and deepest southern panoramic golf and water views from this magnificent serene pool home. Ultra Bright! Done smartly with the soaring ceilings, knockdown texture, lovely neutral kitchen, voluminous well placed windows accentuating the views, sun on the pool most of the day. Pool resurfaced, with pool heater, 2015 dual zone air conditioning, custom changes to kitchen drawers, led lights throughout. HUGE master bedroom. Murphy bed and furniture is negotiable. 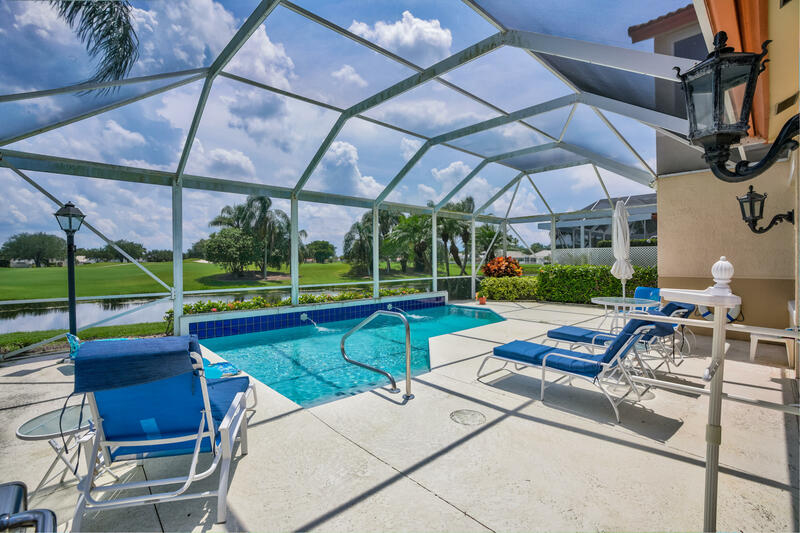 Terrific Double gated community of Monterey Pointe in PGA National's Eagleton. Nice Community pool. View is water first then golf behind for more privacy. Natural Gas utility so gas stove and other gas amenities.